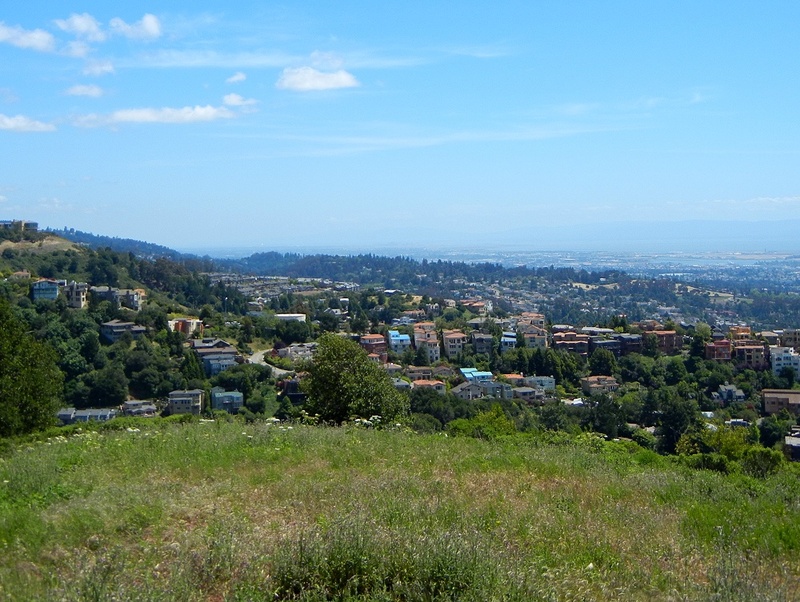 I’ve posted three other shots from the walk I took in late May to the ridge at the top of Oakland’s own Panoramic Way, overlooking Claremont Canyon. This is the view south over the rest of Oakland; click it for the 1000-pixel version. The homes in front are in the Grandview neighborhood, and behind them are the tight ranks of Hiller Highlands. The dark notch beyond is where the Hayward fault runs. On the right side we have Broadway Terrace, the blond summer sward above the top of Mountain View Cemetery, and beyond them San Leandro Bay and the airport on the peninsula known as Bay Farm Island. Every year this hill repeats this season. I must return here, too. This entry was posted on 14 December 2011 at 3:28 pm and is filed under Oakland geology views. You can follow any responses to this entry through the RSS 2.0 feed. You can skip to the end and leave a response. Pinging is currently not allowed.